When you think of Memphis, what is the first thing you think of? The Blues? Elvis? The Mississippi River? And…have you been to Memphis? Smack dab in the middle of the country, you’d think that many of us have spent a few days or at least a weekend there…but have we? Until not too long ago, I hadn’t. Neither had Rusty. In fact, almost everyone I mentioned Memphis to said – “I’ve always wanted to go there.” So why not? I was pleasantly surprised to find that Memphis was a small and friendly city. While it is spread out a bit, the downtown area is lovely, and walkable. I guess I always judge a city by its walkability – I like to be able to safely venture out from my hotel and walk to dinner, or to a museum, or just shop and take in the local scenery. Memphis scored pretty high for me in this regard. So, it got me to thinking. 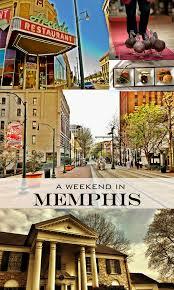 If I were going to plan the perfect weekend in Memphis, to tell my friends about, so that they, too, could experience it, what would I tell them? Arrive into town early and check in to your hotel. 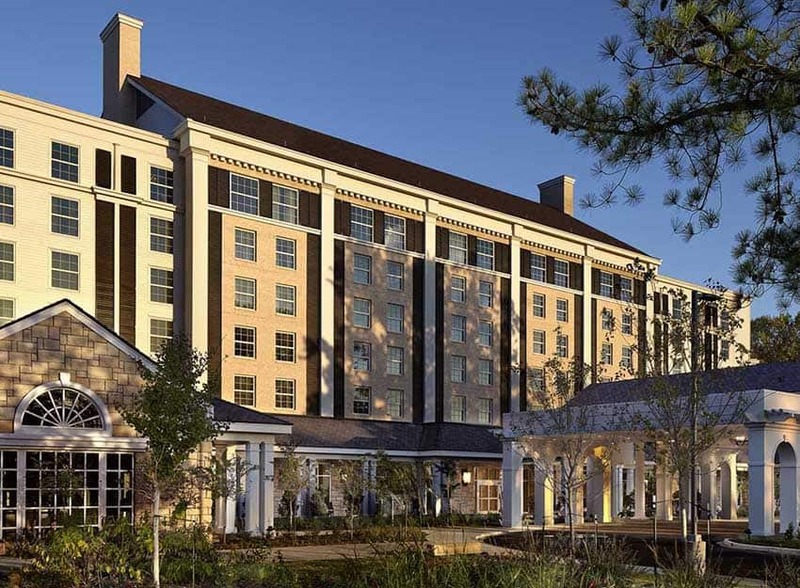 I recommend The Peabody…yes, it is a little more expensive (you can snag a room for around $200-$300) but this is a very special hotel. It’s in a GREAT downtown location, and is oozing with charm and history. Since the 1930’s, the hotel has been home to a group of ducks that spend their days hanging out in the lobby fountain. At 11am, the Duckmaster leads these ducks from their special penthouse into the elevators, and down to the lobby, where they march straight to the fountain. At 5pm, he leads them back to their home for the night, from the fountains, back up the elevator, and to bed. Guests clamor for a good spot to watch, and children are given the best “roosting” spots, seated cross legged right by the red carpet. It’s a fun experience, and one you will likely not forget. So, get to the lobby around 4, and grab a seat in the bar area near the duck-walk. If you are drinking, you can sit there as long as you like and have a great view when the time comes! Otherwise, prepare to be roped out of view – no non-drinking in the bar during ducktime. You were warned! After the parade, go up to your room and get ready for a nice dinner out. Just down the street from the hotel is one of the best (if not the very best) meals I have ever had…at Flight. Flight is a clever restaurant, serving FLIGHTS of food – you do not have to choose just one entrée – you get THREE small ones! All will be amazing…Rusty and I got to sample SIX between the two of us, and each were delicious. The desserts were top notch too! We really enjoyed the location, the food, and the atmosphere, and we can’t wait to return. If you are still feeling the night, right outside of Flight you can hire a horse and carriage to give you a special tour of the downtown area. Romantic, insightful, and historic, it’s a great way to wrap up a wonderful first day in town! Upon your return to the Peabody, you can make a trip up to the top floor to check out where the ducks live. While their little penthouse is neat to see, the actual rooftop is the star of the show. 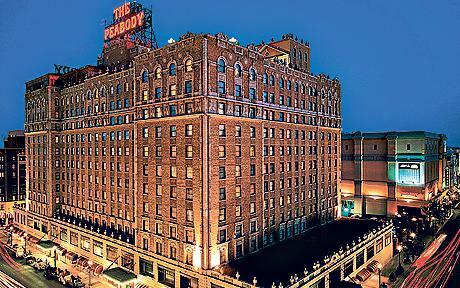 Sweeping nightline views of the city are incredible from behind the well-lit and well-loved Peabody sign. Now, get some sleep in your fanciful Peabody guest room, and make sure to pack away that little duck shaped soap! Sleep in a bit, say good-bye to the ducks, check out, then plan for a full day of nostalgia! Start it off with breakfast at Arcade. Great meals, great ambiance…you’ll feel like you stepped into a time machine! 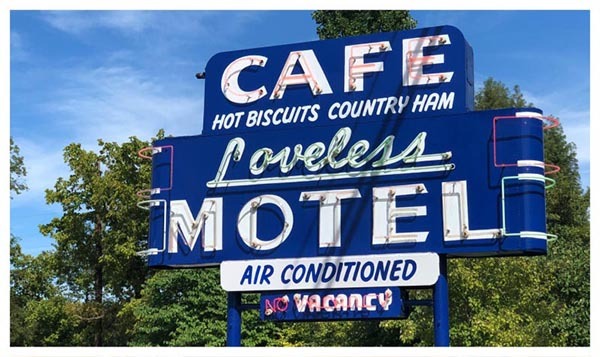 A full on 50’s diner, with records and booths (of course, one dedicated to Elvis himself), so fill up those bellies because you have a big day ahead! 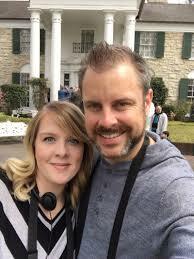 I had been excited to visit Graceland for as long as I can remember. I’m not exactly sure what I expected, but I KIND OF got it? The house itself is worth the price of admission – but be aware, you need to purchase tickets across the street from Graceland versus actually just showing up at Graceland. You will be given an entry time – it may be in 30 minutes, it may be in two hours, depending on the crowd. You’ll be asked to watch an intro video, and then delivered to the main house by bus…from ACROSS the STREET. This is actually a bit of a wait. They only allow so many people in the house at once, so be prepared to sit for a bit. You are given a tablet and a pair of headphones (it’s John Stamos!) to act as your guide through the house. You enter into the foyer, where you can gaze into the living room (white carpet, no touching!! ), and the dining room (again, just look from the foyer). From here, you go through the CARPETED kitchen, and downstairs into the rec room and game room. (My word, the entire room is covered in the exact same fabric, furniture, ceiling, etc.!) You’ll make your way back upstairs to the Jungle Room (so much green shag carpet) and then…out the door. 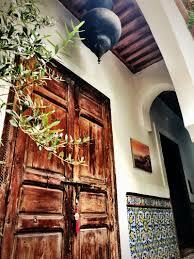 You will not see anything upstairs, as it is off limits and private. Apparently Lisa Marie still visits on occasion and keeps the house as her house…no tourists in the bedrooms. Out back you tour the rec rooms and garage area, and a museum of sorts, then wind your way to the pool. 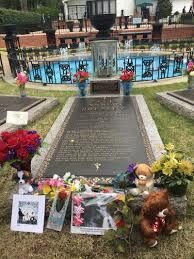 I’ll admit, I teared up along with several other visitors when we were faced with the graves of Elvis and his family. They are located adjacent to the pool, and are flanked with trinkets such as teddy bears and flowers left by tourists each day. It’s a good tour, and I am glad we did it…though it’s a bit spendy and I wish it had offered more. The rest of the Graceland complex across the street houses his airplanes (which you can tour) and then a plethora of gift shops flanking more memorabilia. Lots of the installations are good, and interesting, for sure, but the enormity of the gift shops make the whole thing feel – not nice. Like a money racket. I wasn’t crazy about that, but, I guess money talks, right? As for the museum area…most of it was his clothing. Elvis was a little man, y’all. His suits were tiny, even the “Fat Elvis” suits. And don’t get me started on Priscilla’s clothes. SUPER TINY. Wow. I had no idea, I just assumed someone that famous must be larger than life. It was fascinating. Now that you’ve spent the day at Graceland, scoot next door for the night and stay at the Guest House at Graceland. Literally, it is right next door, and is a fantastic hotel. It’s chic and Elvis-y at the same time, modern and yet comfortable. It was supposedly decorated by Priscilla, and if that’s so, I think she did a great job. I fell in love with the incredible wallpapers! Cool photos of Elvis grace the walls, and the bedding is luxurious. You can even listen to Elvis music non-stop in your room if you desire. After you’ve checked in and had a look around, go find yourself some infamous Memphis Barbeque for dinner. Thrillist did a great round up of their favorites, and you can’t go wrong with any of their picks! Hopefully your room rate included the buffet breakfast at The Guest House, because they have a very nice restaurant called Delta’s Kitchen (3 kinds of biscuits!)! Load up, pack up, and set out to see anything else that may have intrigued you about this incredible southern town. Mud Island? The Blues? You have time, so go enjoy! Want more travel ideas? We have lots! 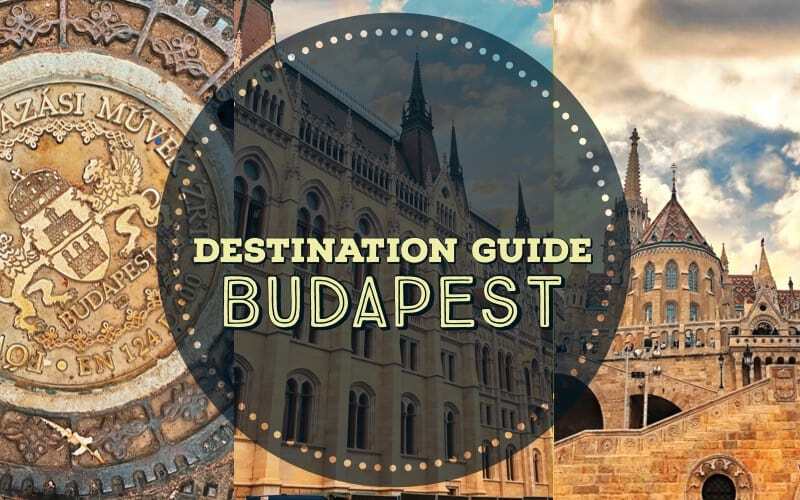 Check out our Destination Guides here. *Disclaimer – photos of The Guest House are from the hotel website. Photos of the Peabody room and roof are from the hotel website.